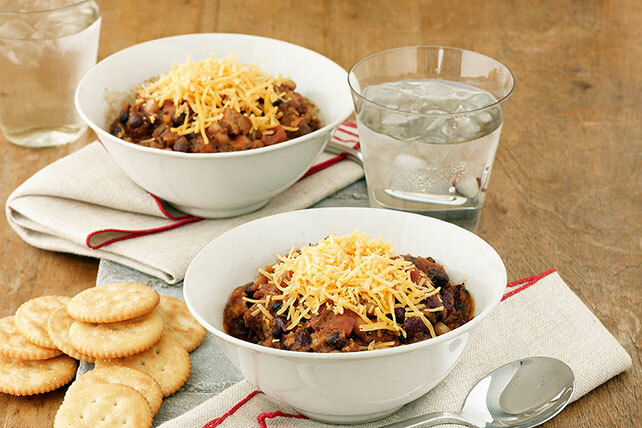 Fix a flavorful turkey chili in just 15 minutes. Bring together the ingredients for our Quick Turkey Chili and let the slow cooker do the rest of the work. Cook turkey in large saucepan on medium heat 10 min. or until no longer pink, stirring occasionally. Add to slow cooker with all remaining ingredients except cheese; stir. Cover with lid. Cook on HIGH 3 to 4 hours (or on LOW 5 to 6 hours). Spoon into soup bowls; top with cheese. Serve with RITZ Reduced Fat Crackers. Cook turkey in large saucepan on medium heat 10 min. or until no longer pink, stirring occasionally. Add tomatoes, salsa, beans and seasonings; mix well. Bring to boil; simmer on medium-low heat 10 min., stirring occasionally. Spoon into soup bowls; top with cheese. Serve with crackers. Substitute 8 KRAFT 2% Milk Singles, cut into heart shapes, for the shredded cheese.